Bega TAFE Federation members and the local community are still deeply concerned about plans to further build on the Bega Connected Learning Centre (CLC) site rather than the existing TAFE campus. 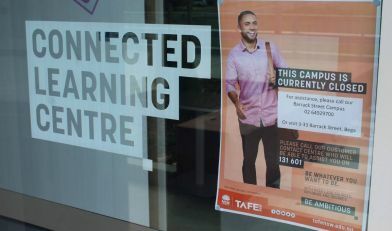 Only opened in February 2019, the CLC was flooded on March 18, leading to its closure and requiring students to be accommodated at the existing Barrack St college. Members expressed their gratitude that the Barrack St campus was open and able to teach the students. A TAFE spokesperson announced “some minor works are underway to improve drainage” at the CLC. With the election of the Berejiklian Government on 23 March, the plan is to close the Bega College in 2021 and build another $17 million building on the Auckland Street site. Federation will continue to campaign and negotiate with members, students and local community to stop the further construction on Auckland St and invest in the Barrack St TAFE college.